of Geysers" is found here. 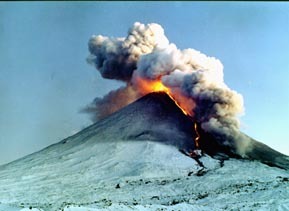 Kamchatka, a peninsula comparable in size to Japan, is washed by the Pacific Ocean and the Bering and Okhotskoe Seas. Russia's large volcanic belt , made up of 29 active craters, stretches along its shore. 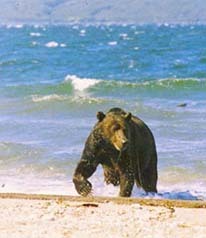 Though the flora and fauna, as is characteristic of northern regions, is not marked by diversity, more than half of the world's Steller's Sea Eagles, as well as the largest population of brown bears, are found here. On Kamchatka you also find the last stretches of Siberian taiga. The waters around Kamchatka are inhabitated by the rare gray whale and approximately 300,000 seals, sea lions, otters and other sea creatures. Kamchatka is also home to one of the largest surviving wild salmon populations left in the world. 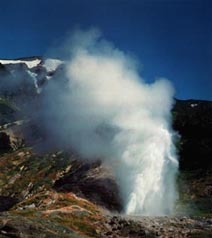 In the center of Kamchatka is found Eurasia's only Geyser Valley. More than 150 thermal springs are scattered throughout the peninsula. Kamchatka is very sparsely populated, averaging less than 1 person per square kilometer. Most of the inhabitants live in the regional capital, Petropavlovsk, but a traditional way of life continues in the peninsula's many scattered villages. Despite its pristine appearance, however, Kamchatka struggles with pollution problems, much of it stemming from the large military presence on the Peninsula. The local economy in Kamchatka is severely depressed, making large-scale mining and logging harder to resist. By supporting sustainable economic development in Kamchatka, you can help locals feed their families without having to destroy their environment in the process. One way of doing this is to support eco-tourism on the peninsula. By visiting Kamchatka with an environmentally-responsible tour company, you help the local economy while making environmental protection an economic priority. If you have any questions or comments about this page or about Kamchatka in general, feel free to write me, Andrew Logan. Want to see something added to the site? I welcome your feedback. What's new at this site.